New for October 2017! This coupler is in a rare class of planar three-way dividers that theoretically can have perfect isolation. Another example is the branchline coupler, you should compare the two if you are in need of a three-way divider. This three-way rat-race was pulled from a patent by ITT back in the 1981, we saved you the trouble of looking for the patent, just click below to read it. The inventors are Jeffery Nemit and Bobby Sanders of California. It was not called a rat-race, but we insist that it is related. If you took two rat-race couplers fed at the sum port, flipped one and dropped it on top of the other so that they share a quarter-wave line and the same input, this is what you would get. Note that we could just as easily called this a three-way Gysel power combiner, we didn't think of that until after we started this page. Hopefully Mr. Gysel will take no offense. We already taught you how to design N-way Gysels that are non-planar. 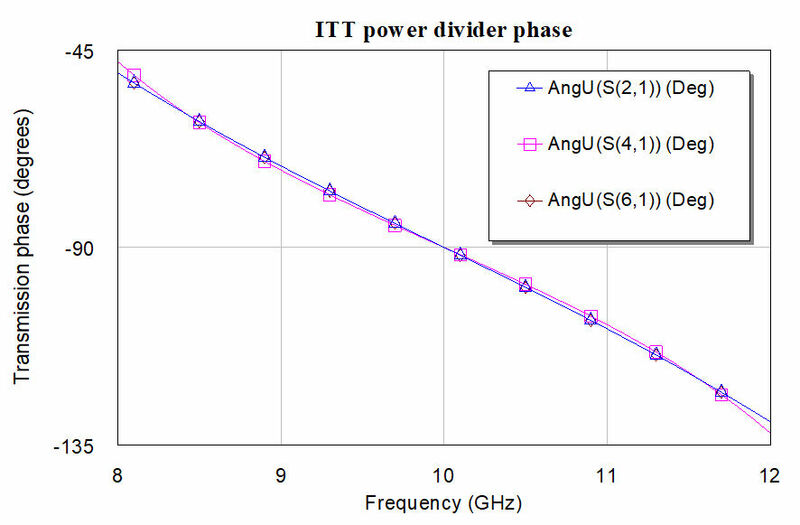 We made a schematic of it in Microwave Office and let the optimizer rip. 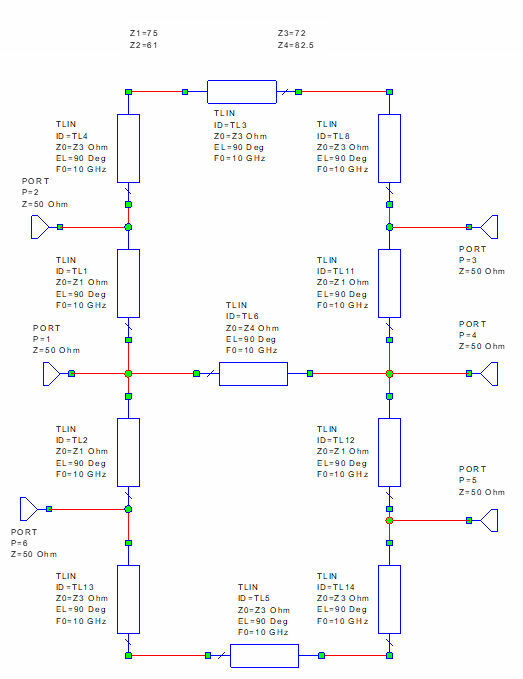 Port 1 is the input, and ports 2, 4 and 6 are outputs, which are not all on the same side. 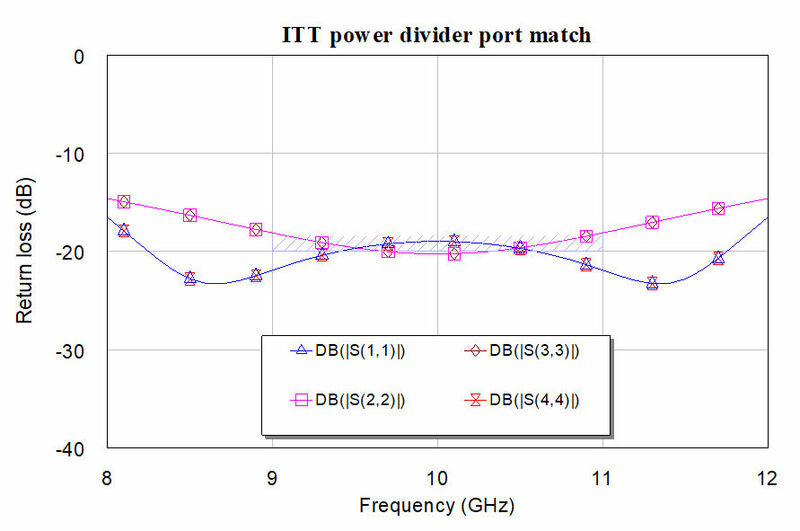 Ports 3 and 5 can be terminated with 50 ohms (Z0). Note the beautiful symmetry in both X and Y directions for this network. 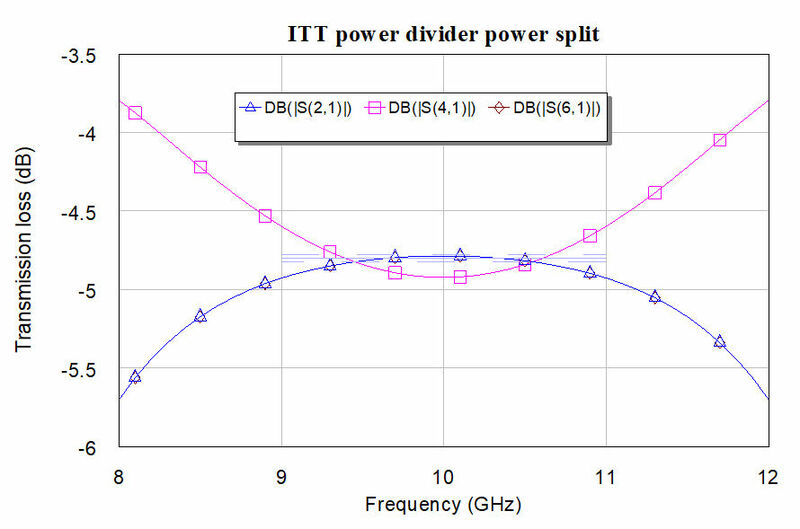 Below is the power split, with a target of -4.8 dB. It performs great over 20% bandwidth. Here is the match. We wanted 20 dB but accepted a compromise to get more bandwidth. Below iare the phases of the three output ports. This is an in-phase combiner, much like the Gysel combiner. 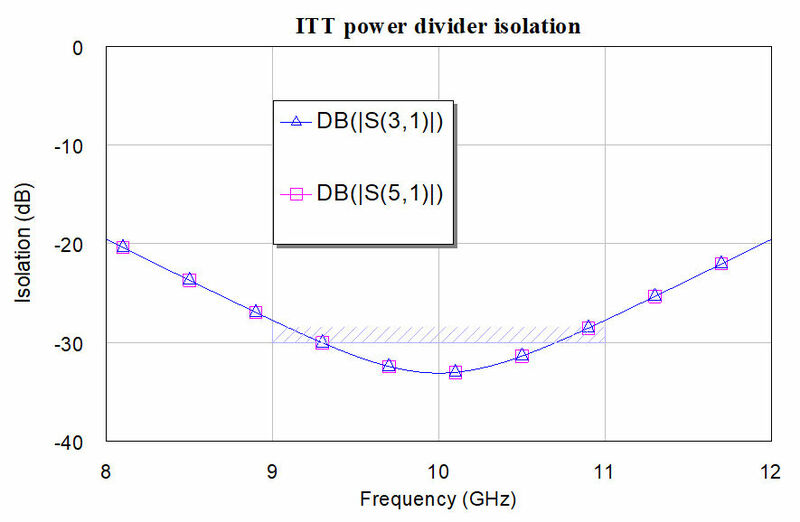 Note that you could easily optimize this network for unequal power division.